Establish a group of users who all have the same administrative level within the system. Create a group of users who can easily be assigned to a project. Some groups may be permanent, such as the default groups described below, or ones that are aligned to specific LOBs or departments. Others may serve a temporary purpose, such as a group created for a specific project. The default view of users on the People page displays the members of the Everyone group. This group's settings cannot be viewed or edited. To be removed from the Everyone group, users must be deleted from the Definition Center. The primary purpose of the Everyone group is to add all active Definition Center users to a project. To create a new Group, you must belong to either Administrators or Managers group. 1. Click on the dropdown by your name in the top-right corner > Users & Groups. 2. Click the New link in the upper right corner of the Groups box in the left column of the page. The Create Group dialog appears. 3. 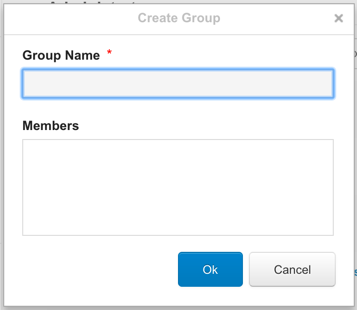 Enter a descriptive name for the Group in the Group Name field. If desired, add members to the group by typing names into the Members field and selecting users picked up by the auto-complete feature. 4. Click OK. The new Group now appears in the Groups box. Add existing users to the group by clicking the Add Members link. Create new users and add them directly to the group by clicking the New User link. Remove a user from the group by simply clicking on the 'X' to the right of their name, or by selecting the checkbox next to the user > More Actions button > Remove From Group. View projects shared between you and the group by clicking the Shared Projects tab. For group members, perform any of the other user administration tasks described above. Click on the Pencil icon next to the group to edit the group name, delete the group or add members. 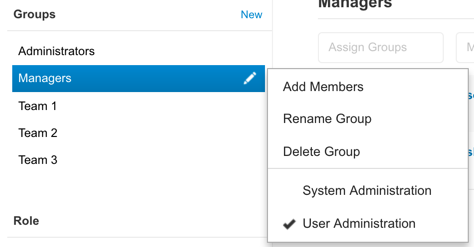 Users with administrative rights can access additional group settings by clicking the pencil icon to the right of the group name in the Groups box. 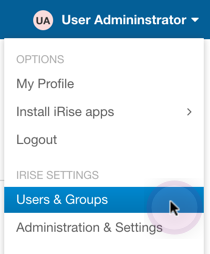 The menu that appears includes options for renaming or deleting the group (the Administrators group cannot be deleted), and also for applying administrative rights to the group. When administrative rights are assigned to a group, all of the group members inherit those rights system-wide. For example, if a group is given system administration rights, any member of that group will be able to exert those rights anywhere in the system. For this reason, administrative rights are typically assigned only to a group that was specifically created for that purpose. There are two administrative levels in the Definition Center: System Administrators and User Administrators. The table below describes the different permissions possessed by these two groups.